Tourism Tech Adventure Forum as an invited by UNWTO-United Nation World Tourism Organization, I will participate as a national delegate of FOCNC division and as parliamentary of Asgardia at the Forum of Innovation Tech Tourism Adventure in Cartagena, Colombia South America 29th April, 2019. A scenario that give us the opportunity to promote our nation with internationals and locals opening new opportunities with worldwide organizations! Uniting Asgardia with the world through the Intangible and Tangible Heritages of the Tech applied to the worldwide tourism industry! Spatial Technology to Apply at Gastronomy! A prominent industry for the survival of the human future in Space and on Earth! I am part of the Culture Committee and as a simple Asgardian Citizens, I will participate as an advisor and consulting, invited and registered by the Franchise Mr.Edd Cocktail Ceviche Gourmet Art Exhibition & Fast Seafood and FOCNC Colombian Division. Uniting the World with the Intangible and Tangible Cuisine Heritage! Franchise will open in Miami, Barcelona, Sao Paulo, Lima, Jerusalem and Cali. If you want to support the participation or you are interested in knowing. I invite you! An unique, sustainable, environmentally friendly concept that combines art, exhibitions and nutritious food with a sea flavor, while preserving marine life. A kosher product! Uniting Asgardia with the World through the Intangible and Tangible Space Culture Heritage! 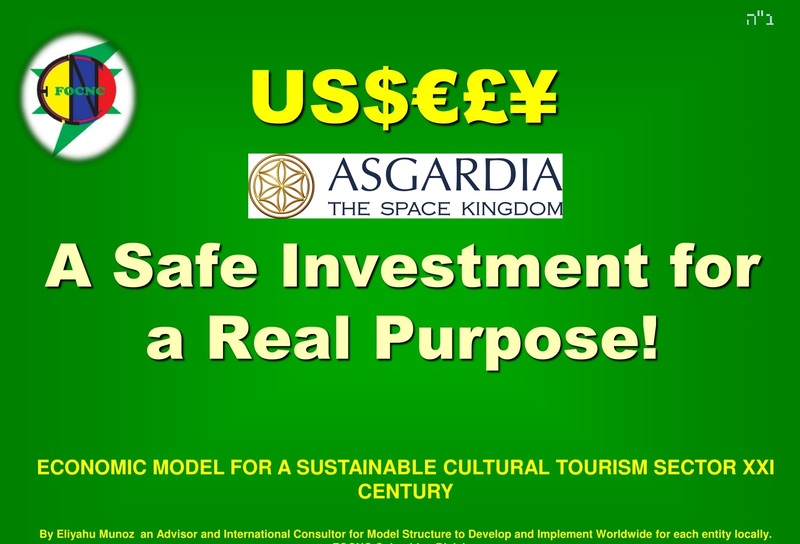 A resource for the Strengthening Local Economies and a great opportunity to unite Asgardia with the World through the Intangible Culture Heritage! As an active member and an international delegate for the Board Directors of the Federation of European Carnivals Cities - FECC entity with more than 52 countries members in its history of founded since 1,980! As part of the culture committee of Asgardia, I invite to all Asgardians to participate and start to integrate and create an identity of our new nation on space to bring and unite your own celebrations and culture traditions around the intangible culture heritage as are the Carnivals, Festivals and Fairs. This invitation help to create a stage to talk about carnival on space and involve with other in the earth as a cultural exchange as is the "Carnival" that involve more than 48 industries in one! Very important to be aware how the culture unite the nations in one with their own legacies with respect and appreciation about their cultures and traditions that help us to understand the humanity with the best of each one with art, creativity, culture, history and more, that involve the gastronomy, music, craft, design, sculpture, theatrical performance, dance and folk sectors applying the technology. The most important "strength the local economies to incentive a real cultural, education and a sustainable tourism heritage"! A world of more opportunities for Asgardia and its future goals! More than welcome to the next FECC 39th Convention in Turkey! Opening new options to integrate Asgardia as nation and its participation as a new potential member! If you are interested contact us and We will send you all the full program and the form registration for convention and hotel, also through will book your flight best tickets options from All over the world to Turkey! For just 510 Euros to FECC Members and 560 Euros guest non Members before March 22,2019 to register , and 560 to 610 Euros after deadline register. Single rooms an extra charge of 160 Euros for all eight days convention. Including stay, food, formal activities invitations, tours and pick up airport transportation to the Hotel Host Convention Thermalium Wellness Park Hotel, one of the 10 most Luxuries Hotel in Turkey! You will enjoy a full program of culture activities at the majestic and historical Turkey in Yalova, Istanbul, Bursa, Iznik, and Princess Island in Marmara Region! Thank you to follow up my post! This is our mission from the Culture Committee unite Asgardia with the World through the culture, respecting to everyone and the most important; to enhance the positive of each culture that allows us to integrate as true Asgardians citizens, to exchange all the cultural, historical, ethnic richness with millenary traditions that will help to preserve them for time, distance and space in one nation! Thank you for this example :D it was suprising to see our cultural characters Karagöz and Hacıvat in here :) And of course thank you to Yalova city for protecting and remembering them. I wish you a new 003/2019 full of Health, Peace, Love and Prosperity! All the best for you family and friends! Eliyahu. Te deseo un nuevo 003/2019 pleno de mucha Salud, Paz, Amor y Prosperidad, para ti, la familia y amigos! Todo lo mejor. Eliyahu. Colombia and Ecuador signed an agreement to launch a lunar mission! Check it out! It is a great step and the beginning towards a near future, where Colombians can observe and contribute to space research. Uniting the World with the Intangible Culture Heritage! The next step of Asgardia through the Ministry of Culture & Tourism,Trade and Commerce is become a new member of Federation European Carnivals Cities with more than 52 countries members. Worldwide Federation European Carnival Cities FECC Journal 2018/2019. FOCNC Colombian Division promoting and uniting Asgardia and the world with the Intangible and Tangible Culture, Tourism and Education Heritage. Implementing the Economic Model for the Cultural Tourism and Education XXI Century. I am very glad to share with the Asgardians that I will present an international Conference through the FOCNC Colombian Division . "The Economic Model of the Culture, Tourism and Sustainable Education Sector" It will be presented on August 3, 2018 in Sardinia, Italy. As International Speaker and parliamentary of Asgardia I have the opportunity cross and introduce Asgardia in important scenarios to strengthen the links! Sure! Thank you to share it! All the best! Thanks very much! It will be another great place to bring together the nations with a great goal! Congratulation a very nice event. Thanks whom voted for me ! I am Officially Declarated as a Parliamentary for Asgardia 1st Space Nation! We will do the best to get Asgardia a nation for the human benefit! Eliyahu Munoz - Parliamentary of Asgardian 1st Nation on Space 2018-2023. Hola Juan, enviame ti email para ponernos en comunicación directa. Gracias. As a member of this Argardia nation, elected mayor of the city of Cali, I welcome you and offer you my most sincere congratulations. The future is now ! Muchas gracias Martha por su mensaje. Todo lo mejor! An very interesting Post of a Candidate for Minister of Culture! Thanks for your Support and Believe in my Skill to help the next step of Humanity! Gracias por su Apoyo y Creer en mis Capacidades para ayudar al próximo paso de la Humanidad! 1 Left Day to Vote for Me! 1 Día para Votar por Mí. Thank you for your Support and Believe in my Proposal! Gracias por su Apoyo y creer en mi Propuesta! Uniting Asgardia and the World with the Intangible and Tangible Culture, Tourism and Education XXI Century, Space Sustainable Heritage! I am part of the new generation making the Transition from Fiction to Reality! Sharing my experiences, knowledge and dreams, to unite the world to reach a great Goal. Asgardia! All the best! Your Friends. UNITING ASGARDIA AND THE WORLD WITH THE INTANGIBLE AND TANGIBLE, CULTURE, TOURISM AND PEDAGOGIC, SPACE SUSTAINABLE HERITAGE! I invite you to share without limiting your educational, social, economic, cultural, ethnic, religious or gender status. In the end, everybody we have to live together in the same town, city, region or country and only then, we continue to achieve awareness of the changes that we want and need, not only where we are, but in the entire world, including those who have erroneously acted . Let's do of Asgardian a nation for all to live in Peace! Federation of European Carnivals Cities FECC International Delegate with more than 52 members countries. Experience working with global business community cultures and customs, that I offer to help to grow Asgardian as a Model Nation for the next step of the humanity! Researcher , Author, Founder of non-profit entities with an international profile to implement new logistics self- sustainability that serves as a model for more than 80 countries around the Intangible Cultural Heritage. Creator of alternatives for different areas in the Culture Sector, as the Preservation and Safeguarding of Intangible Heritage, International Insurance, Entertainment, Health and Social Welfare in the United States, Latin America and Europe. Tv Host, Researcher, Writer and Producer of Crossing the Threshold with more than 100 themes, documentaries, Film, television segments including the Conferences presented in many countries. Ariadne, un gran gusto y gracias por tu loable comentario. Termine en Distrito 1 porque algo paso inicialmente que aun no se había confirmado el de español, luego se cambio y después de verificaciones lo Activaron en Distrito 1 directamente por Asgardia. Pero igual uno puede registrarse por el Distrito que prefería, porque por mi trabajo estoy entre Miami, Colombia y Europa. Todo lo mejor y nuevamente un gran gusto y siempre será para complementar, nunca para conflictos de ningún interés, sino ser la nueva generación que debemos dar paso ayudar a mejorar la que no han podido! The Space Technology the new Cluster a reality as a seed that germinates in Colombia through Cali Valle del Cauca by FOCNC Division Colombia with a comprehensive vision for the benefit of present and future generations such as Space Technology applied to all sectors with a great example and tangible Model with the new nation in space. Introductory Conference with space-inspired art and applied to the theme exhibited by the Astronomic Observatory of Valle del Cauca, its group and the departmental library of Valle del Cauca in Cali Colombia. Nostalgia por no darme cuenta de un evento como este! Te gusto? Gracias!! Todo lo mejor. Eliyahu Eduardo. MAYO 3, 2018 CONFERENCIA: "Introducción de lo que será el 1er Foro de Tecnología Espacial y la 1era Nación en el Espacio Asgardia"- Noviembre, 2018 Cali, Colombia Sur América by FOCNC. MAY 3th, 2018 CONFERECE: Introduction of what will be the 1st Technology Space Forum and 1st Space Nation "Asgardia" Convention November, 2018. Cali Colombia South America by FOCNC. Mañana 3 de Mayo, Conferencia. Introducción de lo que será el 1er Foro de Tecnología Espacial y la 1era Nación en el Espacio Asgardia- Noviembre, 2018. Biblioteca departamental Jorge Garces Borrero Salon Jorge Isaac. 7.30 a 9.00pm. Colombia desde Cali Valle del Cauca haciendo la Transición de la Ficción a la Realidad! Muy Buenas Tardes! De antemano felicidades Señor Parlamentario por su nombramiento! y como inquietud Deberian llegar invitaciones a los ciudadanos, no estoy seguro si asi lo es y yo no la vi en su momento, quisiera estar mas al tanto en todo lo referente a la nueva Nacion Espacial... Gracias!